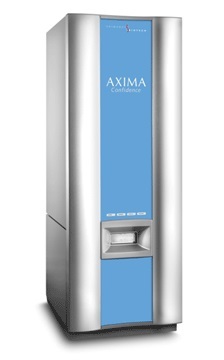 The AximaConfidence™ is designed with the general analytical and life science laboratory in mind. Incorporating a variable repetition rate 50Hz N2 laser, the system provides rapid, high quality MALDI mass spectra and an array of software tools for data processing and reporting. Linear mode allows the integration of high molecular weight samples, whilst reflectron mode, incorporating the patented curved-field reflectron (CFR) provides the high resolution and mass accuracy necessary for successful proteomics and life science experiments. Positive and negative ions are included as standard allowing greater flexibility . The patented beam blanker optionally removes unwanted low mass ions and prevents detector saturation. Excellent sensitivity is achieved using near normal (on-axis) laser irradiation and advanced ion optics for enhanced ion transmission. MS/MS may be easily performed using a seamless approach-ions of interest can be isolated using a precursor ion selection device and data-rich fragment ion spectra quickly and simply acquired . The system supports standard microtitre plate format 96 or 384 well targets. Fleximass™ microscope slide (plain or 48 well targets) and a wide variety of adapters for unconventional samples, are also available. Application-centric data processing software packages - PolymerAnalysis™, OligoAnalysis™, provide solutions to many common analysis requirements. Intellimarque™ has been uniquely designed for proteomics experiments with a flexibility to user workflows involving data-dependent peptide mass fingerprinting and MS/MS for protein identification .